We have a new “stained glass” front door! This one is made with contact paper and flower petals and may be my favorite yet plus it is the perfect spring flower craft. I love it! The front door window is our big spot for displaying seasonal changes in art and decoration. Until yesterday we had a big scribble stained glass up, which I still think is awesome, but the flower petal stained glass is just so fresh and cheerful! Arranging the flower petals and leaves on the contact paper was both fun and relaxing. I did most of it, although that wasn’t my intention; I had the contact paper set out as an after-school project. Maia had a friend over, though, and they were in play mode rather than art mode. Which was fine. Rather blissful, in fact. Daphne hung out on the fringes of the big kid action while I created flower mandalas and other designs. We all love our new stained glass door! P.S. You can see all of our many stained glass door versions here, as well as lots of other stained glass and suncatcher crafts. P.P.S. If you’re interested in another spring flower craft, here are some beautiful flower petal crowns. And here’s a flower suncatcher (in the perfect frame). I love this & have a door just like it at home. Can you explain how it’s a fixed to the glass? I’m assuming you just put petals to contact paper and then cover with another sheet? Thanks I look forward to your blog EVERYDAY! Much love to you mama! 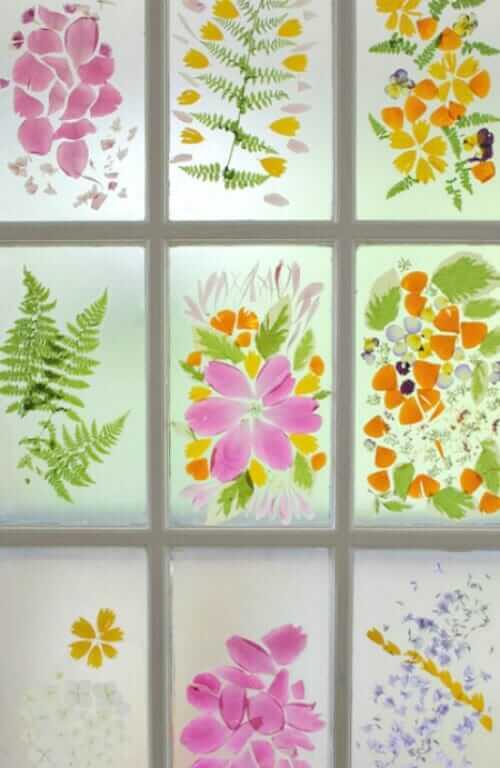 We love to arrange between laminate sheets and then laminate and hang or fix to various windows or make floral suncatchers. That is so incredibly gorgeous!! I want to do it today, but I have so much packing to do- it will have to wait until we get back from Wisconsin! This is so lovely I’m so bummed out I just threw out some dried out flowers yesterday. I have a few in the vase stills and a rose not too dried. They look lovely on your door. that is so pretty I gotta get contact paper this weekend!!!! :) thank you for posting this!!! These are simply gorgeous. Do the petals stay “fresh” under the contact paper, or does this type of decoration only last for a few weeks before they start to wither? I love how this looks so much I want a door like that! Wow, that is gorgeous. I can’t wait to try it! We usually sandwich the flowers (or whatever) between two sheets of contact paper and that would work for this. This time, though, I just stuck the sheet of contact paper directly on the glass, sandwiching the flower petals between the glass and contact paper. Does that make sense? I had to make sure to leave enough of a sticky border so that it would work. Truly Amazing work! I love it! so beautiful! and i think it’s good for us parents to feel the freedom to make art ourselves too… thx for the idea and that reminder! Totally fantastic. Did you press and dry the petals and leaves, or just leave them fresh? My 6 y.o. is currently obsessed with drawing on our glass french doors with window crayons, and I think this would be a wonderful extension for her. So, pretty. Picking and pressing the flowers would be one of my favorite parts of the process too. Did you have any problems with sticky residue on the glass after you removed the contact paper? I love the way it looks adhered directly to the glass windows. This is so lovely. Now I know what to do with the wild flowers we planted in our courtyard. What fun and seasonal celebration. Thank you for all of your inspiring posts. Jean, this is beautiful. You didn’t press the flowers, did you? My grandma has always made cards of pressed flowers and I think they are so lovely, the door just reminds me of them! Jean, this is an amazing project. What a way to bring art, beauty and nature together. Well done. beautiful. can’t wait to try! not to worry, jean, you do so much and i didn’t feel like you slipped off the map at all! i bought organized simplicity as a new year’s resolution, and it’s one of the best purchases i’ve ever made. i’ve been in purging mode since january, and my home feels lighter for it. you won’t be disappointed. best of luck, and look forward to seeing the book! This is at the TOP of my todo list. SO beautiful, bright, fresh. I’ve even got an old window frame to put them in and use as a wall hanging. Oh, my crafty mind is spinning. Thanks for the inspiration!!!!! This is just beautiful! I wonder if you could do this with silk flowers so it would stay longer? It’s beautiful ! thank you for sharing ! Beautiful. I love it even more because you have a Daphne. I have a Daphne Kristina (she’s 1 1/2)! I did this with my kids today. TOTALLY AWESOME! Of course, it was not as “fancy” and I put 2 sheet together to make a “window”….THANK YOU for the idea!! Love it! We don’t have a door like that any longer so I’ll have to figure something else out. I love it,so springlike. I have some old silk flowers I was planning to throw away,might have to try this instead. Feel free to grab my Featured Button. We just did this for our front door today. The boys had a great time collecting the flowers and putting them on the paper. It looks great! I’m always amazed at the creativity that my five year old displays. These are so pretty! 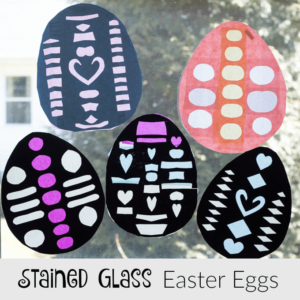 All of your “stained glass” ideas are really fun, but this is my favorite!! That’s a refreshing idea. I like how you try to engage the kids in the project as well, and they expressed themselves very well in your scribble stained glass. I’m excited to see your other creations! It’s fabulous! The flower petals look so cute on the glass. All in all it makes a very lovely entrance to a home. This is lovely. What kind of contact paper did you use? Is it a special kind that will peel off easily when you’re ready for another design? Your handmade “stained glass” door is one of the best door designs that I have ever seen! I sincerely admire your creativity! You’re simply amazing! What an effort! Like what Katie said, I have never seen a handmade stained glass as wonderful as this one! Good craftsmanship! I wish I can have creative hands like yours. I love the effort! I’m not so into flowers, but when I saw your stained glass door, I suddenly changed my mind. Is it hard to do? I’m planning to do it to on our glass door too, but only with butterflies or stars. Hi Jean, I’m Antony from India. Thank you so much for this wonderful idea. I have an doubt that contact paper means tracing But, I have a doubt about the contact paper, is it tracing paper or butter paper? Once again thanks for your wonderful work. Thank you kindly for this wonderfully simple and easy activity. What a creative and fun way to think about decorating windows… a terrific way to celebrate spring and all the events that come with flowers and joy!